We hired a company called Istanbul Walks which provided us with a guide named Selma Şen for a walking tour through the Blue Mosque area. 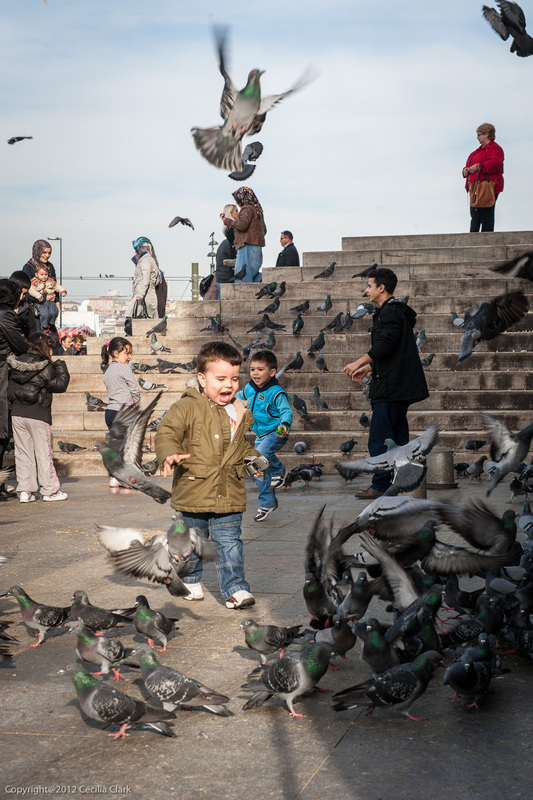 We strolled through the old neighborhoods, toured little visited sights, and thoroughly enjoyed her information about historic Constantinople and Istanbul. One of the sights we saw was the Petty Hagia Sophia. 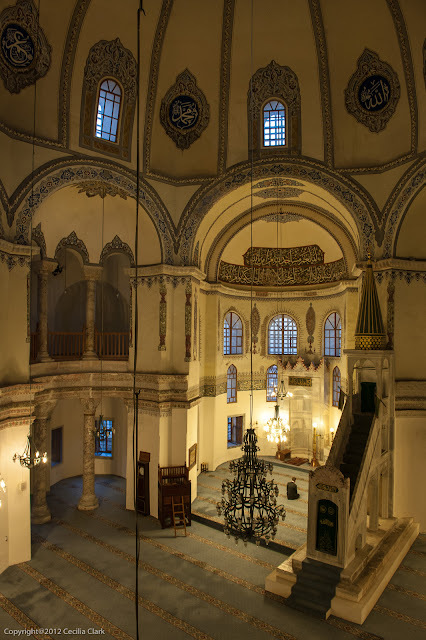 The structure and its history is very similar to the Hagia Sophia. 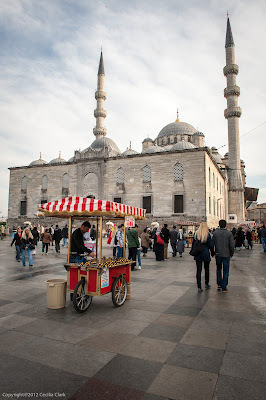 It was built by Justinian I as a church and later minarets were added and it was turned into a mosque. 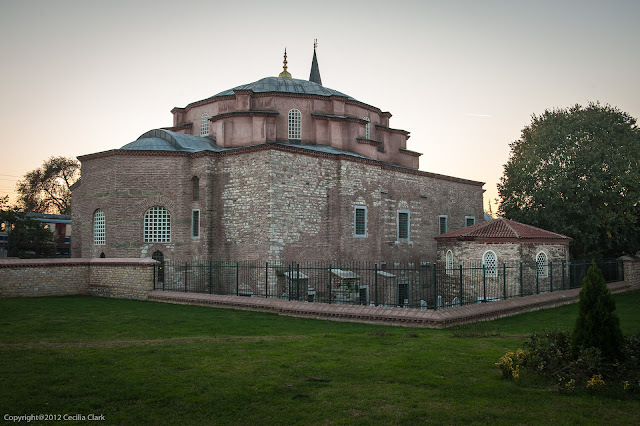 While the large Hagia Sophia is now a museum, the petty Hagia Sophia is still a functioning mosque. We covered a lot of ground during the five hours on this tour. She took us into historic hotels and along narrow streets to discuss Ottoman architecture and those who lived around the Topkapi Palace in the service of the Sultans. 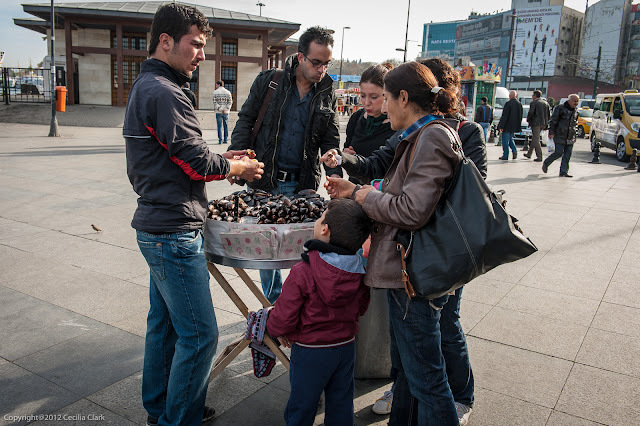 We visited the new Four Seasons Hotel that until the 1970s was Sultanahmet Prison. We descended below a restaurant to see the remains of Emperor Justinian's Palace. Our last night, a full-moon evening, we walked across the Galata Bridge, up the hill to the Galata Tower, the length of Istiklal (Independence) Street, to Taksim Square. The street even in late November was packed with people strolling, window shopping, stopping at cafes, or listening to street musicians. Overhead, Istiklal Street was decorated with blue and white holiday lights. If we didn't already love Istanbul, then this night would have convinced us that we should. Street food in Istanbul is plentiful and everywhere people are in a hurry: roasted corn, roasted chestnuts, hot salep. 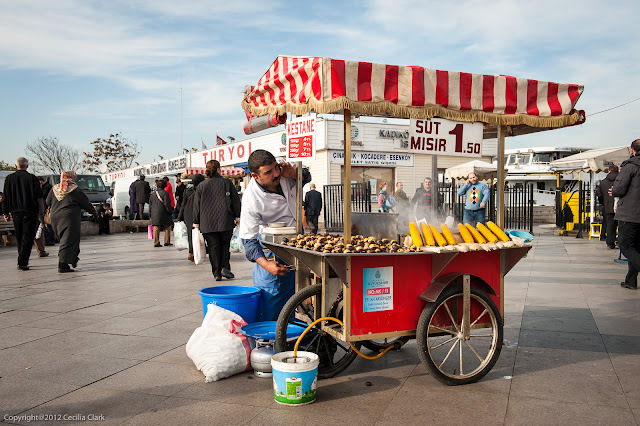 On either side of the Galata Bridge barbecue carts grill freshly caught fish and slip the fish into a french roll for a delicious fast sandwich. 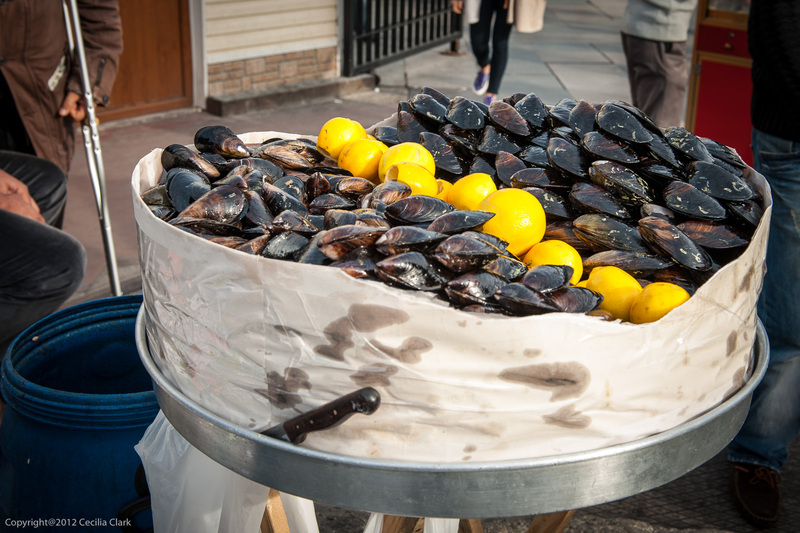 Along the waterfront, mussel vendors do a brisk drop-in business. Stop by, snack on a few mussels, then move on. 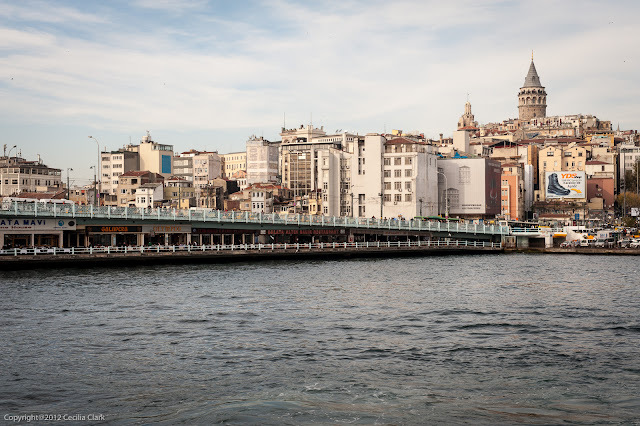 We couldn't leave Istanbul without a Bosphorus boat trip so on our last afternoon, we took a two-hour ferry trip from the Galata Bridge up the Bosphorus past the second bridge. And, then it was time to return to Macedonia. While in Istanbul, we received an email from the US Embassy stating that the Macedonian government had printed our ID cards. Even though I knew that now I was technically no longer an illegal alien, I still cringed when the non-Macedonian woman in the line next to me was asked how long she had been in Macedonia. At that point the man she was traveling with stepped up and the conversation continued in Macedonian while she looked on. In my line, the immigration officer stamped my passport and I quickly left.